I enthusiastically recommend JCMerritt. I first used them to evaluate my home on Lake Waramaug before I purchased it in 2010 and have used them for everything house-related ever since. Jeff and his son Branden could not be more responsive. Day or night, summer or the dead of winter, they answer my calls immediately and make sure things are fixed right away. I have used them for full-blown renovations, for new construction, for repairs, for maintenance and for general advice, and they are spot on every time. It is hard to imagine anyone better. I have worked with JC Merritt for 7 years, beginning with the house inspection and continuing through many, many repairs, renovations and improvements. Every interaction has been thoroughly professional and the work has been exemplary in every regard. They are extremely responsive and go the extra mile for work that is important to us but is not what they’d probably like to be doing (like restocking firewood and extricating the occasional mouse). They are not the cheapest, but on a total cost basis we come out ahead bc the quality is so high that the maintenance is lower in the future. Quality contractors who went the extra mile to guaranteed we got exactly what we wanted. Couldn’t have been happier. We inherited Jeff when we purchased our house in 1988, and he has been wonderful ever since! Quality work for a fair price and prompt attention when there is a serious problem or an emergency. Also, we have complete confidence in the integrity of Jeff, Brandon and the crew who have full access to the house when we are not present. This is critically important. They aren’t the cheapest, but they’re unquestionably the best. JC Merritt has done a lot of work on my home in the last 2-1/2 years. The quality is great and they’re thorough, meticulous and great at diagnosing difficult problems. I’ve come to rely on them for every fix – and there are many. I’ve also recommended JC Merritt to friends, who’ve been nothing but grateful and happy. I recommend them without any hesitation, whatsoever. We have used J.C Merritt for multiple projects. Their company is built on trust. There are very few people I would allow full access to my home while I’m not there. I have always been treated courteously and with respect. i recommend anyone give their expertise a chance on their next home project . Amazing local company. Small enough to offer personal service, yet large enough to handle all facets of construction. My family and I were in desperate need and thanks to a referral from Emmons Tree, we were put in touch with J.C. Merritt INC. My wife and I are beyond impressed and will definitely be refer our friends & family! We used JC Merritt to solve a long-standing issue with a wet basement. The new French drain lives up to their promise of a dry basement! They are truly professional, honest, friendly, hard working and frankly the kind of people to invite to dinner once the project is done! We hope to use them again in the future to solve more of our “old house issues”. We will always provide you with our expert opinion, no matter the situation. We make it our duty to find the best solutions for a problem, and always keep your budget and timeline in mind. We deliver high quality craftsmanship with every project we work on. With over 40 years of experience and happy clients, you can rest easy knowing your project is in capable hands. Our goal is to provide the smoothest experience for our customers. We know that you are making an investment and we want you to be totally satisfied with an outcome you love. Whether you need to create more space in your home or you want to completely redesign it, JC Merritt, Inc. can take care of any size remodeling, addition, or new construction project! You deserve to have the living space of your dreams – a modern culinary kitchen, a relaxing spa shower in your bathroom, a gorgeous custom outdoor seating area, or a completely eco-friendly swimming pool. JC Merritt, Inc. can help your dreams become a reality. JC Merritt can submit insurance claims on your behalf, and can act as a liaison with your insurance carrier after you’ve experienced a disaster or emergency. We have many years of experience helping homeowners handle insurance claims. We can deal with cracked or leaking foundations, beam repair, post replacement, barn repairs, house settlement or leveling, and many other critical home repair issues. JC Merritt specializes in these type of structural repairs and have been helping Connecticut residents for over 40 years. Commercial Contractors you can trust to fully complete your project – start to finish – with amazing results. 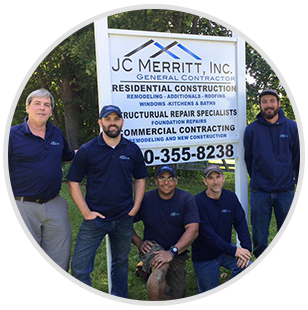 JC Merritt, Inc. has skills, expertise, years of construction experience and trained craftsmen who can manage a substantial commercial project. We have worked on multi-million dollar complexes, housing developments, municipal projects, and much more. We have everything needed to make your project a huge success.